The best stainless steel water filter options are gaining popularity due to their efficiency and effectiveness. They also fit in with a desired look in terms of kitchen decor, relative to other water filter options. Additionally, these filters deliver a superior taste to alternative options. We’ve researched and found eleven top-rated stainless steel water filters of 2019, as well as two you should consider avoiding. What are the advantages of stainless steel in a water filter? Without a doubt, this Berkey is the best stainless steel water filter of 2019. It uses an upper and lower housing with 2 large filters. The filters target various contaminants including fluoride. The water housing unit holds 2.25 gallons of water. The Big Berkey BK4X2 Countertop Water Filter System is the perfect size for anywhere from 4 to 16 people. This stainless steel water filter has become a favorite for homes, and offices. Probably the best feature of the Big Berkey BK4X2 is its lifespan. Berkey filters are known to last through thousands of gallons of water. The 2 large filters that come with this unit will provide purification for up to 6,000 gallons. Finally, the sleek design allows this model to fit into any home or office. It’s easy to clean and has outstanding visual appeal. Without a doubt it’ the best countertop stainless steel water filter. This 3-gallon system is everything a home needs. It comes with 2 large filters and 2 fluoride filters. The entire unit stands at about 23-inches high and weighs about 8-pounds. When the unit is empty, it’s easy to move. The Royal Berkey system is perfect for at home or on the road. Many families are putting these into their RVs. From road trips to kitchen use the Berkey RB4X2-BB Royal Stainless Steel water filtration system. The highly polished stainless steel exterior wipes clean in seconds. You can get rid of fingerprints or debris quickly. The filter system works independently of the fluoride filter to collect as many contaminants as possible. This system is excellent for anyone who needs easy access to great tasting, drinkable water. Boroux Berkey water filter systems are available in multiple size options spanning from 1 to 6 gallons. Every system, regardless of size, comes with a set of 4 12-ounce, stainless steel cups. The stainless steel cups are handy for camping, traveling, or for use at home. 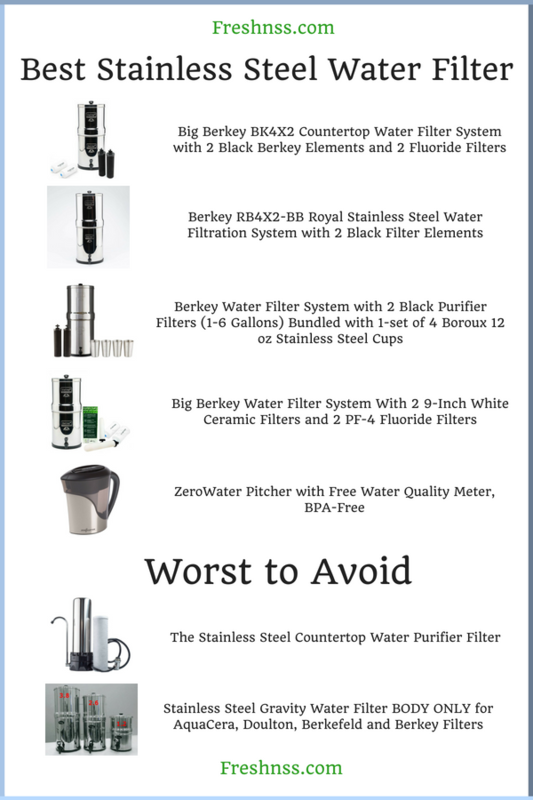 The Berkey bundle is the best Berkey stainless steel water filter. The filters clear out contaminants without electricity. Instead, you load this stainless steel filter with water, and then gravity does the rest. This particular bundle is excellent for people who don’t have access to fresh water. You can load this filter with tap water, well water or even lake water. If you’re on the go or need fresh water, this Berkey water system will take care of your water needs. The purifications elements remove viruses and bacteria but leave valuable minerals in your drinking water. The best stainless steel water filter system is the Big Berkey water filter system. Another great product from Berkey is a system that uses a 9-inch ceramic filter as well as 2 fluoride filters. Unlike other stainless steel water filter systems, this system is self-sterilizing and re-cleanable. These features are outstanding additions for anyone using this system outside of the home. The Big Berkey water filter system with 2 9-inch white ceramic filters and 2 PF-4 fluoride filters works well in RVs or during camping. This filter captures pathogenic bacteria, parasites, reduces pesticides and herbicides. It can hold 2.25 gallons of water and can filter about 15-gallons of water per day. This water volume is enough for up to 16 adults on a regular basis. The ZeroWater pitcher is an excellent stainless steel choice for anyone who needs an NSF certified filter in the fridge. The ZeroWater pitcher is a 5-stage filter that uses only BPA-free materials. The 5-stage filter can reduce the presence of lead and other heavy metals in your water. The best aspect of this filter is the great taste. It’s the 5-stage filter that contributes to this outstanding taste. This filter is available in 4 different sizes ranging from 6-cups to 23-cups. Size is no reason to pass up the best stainless steel water filter pitcher available. The stainless steel design and exterior make this filter pitcher more durable than other options. Best of all, this water filter pitcher removes 99.6% of dissolved solids. This PUR water filter provides excellent design and performance in its Helen of Troy model. This stainless steel style attaches easily to your faucet. The entire system mounts easily and has a clear mineral filter. The best part of this PUR stainless steel water filter is the convenience. Because it’s on your kitchen sink, you have great tasting water right out of your tap. Home tap water might seem clean, but the truth is that there are many contaminants in our tap water. Tap water can also have high levels of fluoride, and heavy metals. The Helen of Troy PUR PFM450S water system filters out over 70 contaminants including lead. This system also filters out chlorine which many cities add to tap or drinking water. After the initial surge of popularity, Brita gained a reputation for having units crack or deteriorate. But, they made a comeback with the Brita stainless steel water pitcher. The benefits the stainless steel design are the increase in longevity and an advanced filter. This Brita pitcher can use the same filters that other Brita pitchers do, but it can also accommodate the advanced filter. The pitcher initially comes with the advanced filter. You can immediately notice the difference in filtering speed and taste. The filter itself is BPA-Free and reduces the taste of copper, mercury, and chlorine. Although it does not eradicate these contaminants, it makes a huge difference. The filters do need replacing every 40-gallons. For a standard household, that is about 2 months. With a similar design to other stainless steel models, the ProPur traveler has a few hidden benefits. Its size makes it an excellent choice for anyone living alone. Many stainless steel water filters will hold over a typical family’s water use. However, this model caters to individuals. It can hold up to 1.75-gallons of water in its reservoir and stands at about 17-inches tall. But, when it’s not in use, you can nest the unit at the height of about 9-inches. The ProPur traveler, stainless steel water purification system, can easily store away in a cupboard when not in use. The It can only hold a single filter, but the one filter also provides fluoride removal. The combination of a standard filter with fluoride removal abilities slims down the design. GOSOIT has an outstanding water filter system that softens and reduces alkalinity. Th filtration system uses a multi-step process that has 9-grade filtration. Removing contaminants within 0.01um. This filter is top notch for homes and offices that have full kitchens. The GOSOIT alkaline water filter system is the best faucet stainless steel water filter. It installs with a faucet right onto your countertop. You can always call a licensed plumber. But, many homeowners can install this stainless steel filter system on their own in a few hours. GOSOIT attaches bacteria, and other harmful substances found in regular tap water. But, it permits the useful minerals to stay. The water softening aspect is a bonus for home chefs. Purified water is best for cooking rice, or other making soup, as well as for drinking. For hikers, campers, or athletes, the Go Berkey Kit will keep you hydrated around the clock. This kit is full of useful items that work together to create a complete stainless steel water filter system. The pack includes a sports bottle, stainless steel Go Berkey, and a Berkey filter. The system is easy to use, even when out hiking or on-the-go. To assemble the system, you insert the filter and then fill the top portion. The water will slowly drain into the bottom portion. Then, you flip the unit over and unscrew the “lid” which is part of the bottom portion of the filter. There is no faucet or drain. The water bottle is excellent for keeping in your hand or attaching to your pack. But, the entire unit is a little heavy. Fully assembled and empty the unit weighs about 3-pounds. It can hold 1-quart of water and filter 1-gallon of water per hour. Zuhne Ren Lead-free food grade stainless steel RO compatible water filter is one of the best options available. The stainless steel cartridge will handle over 500,000 cycles without dripping. The brushed stainless steel ensures that the finish will resist scratches and dust buildup. But, just in case it does have some damage, you have a lifetime warranty on the finish. The T304 stainless steel construction ensures that every part of this water filter is food grade. Use water from this faucet for drinking, cooking, and even cleaning. The water pressure acts similarly to your standard kitchen sink. You won’t be waiting for a minute to have a half-full glass of water. Best of all, this water filter system has certification from 3rd party lead control regulators. It meets all plumbing codes and water efficiency standards. Sometimes a mounted stainless steel water purifier isn’t avoidable. But don’t let the design fool you, you should avoid this Stainless Steel countertop water filter at all costs. The filter and the faucet clog on a regular basis. After 2 weeks there is a noticeable drop in the water pressure. Eventually, the water stream becomes a trickle. But, that isn’t the only issue that comes with this stainless steel water purifier. It is known for leaking after a few weeks of use. Because the reservoir sits on top of the counter in a stainless steel housing unit, the water is icy. But, the water also leaks out of the unit. The leaks, unfortunately, will continue until the reservoir drains and you disconnect the water completely. Gravity water filters are great in theory. These filters typically sit right on your countertop, or table and you periodically fill them. Unfortunately, the Stainless Steel Gravity Water Filter is terrible. The worst stainless steel water filters on the market, and it has no hope of improvement. The biggest issue is that this product is only the housing of the stainless steel water filter. There are no filters included with these gravity water filters. The heights are also strange. They are using far different sizes than similar filters. When assembled the largest size is 24-inches tall. This height will not comfortably fit on a countertop that has overhead cabinets. Even the small units are just too tall to use in a home. Stainless steel water filters are great because of their durability. The best stainless steel water filter should be the size that fits your needs, easy to use, and durable on many levels. Durability: Unfortunately, durability isn’t just whether or not your stainless steel water filter can survive a drop or two. Stainless steel is generally-speaking, very durable. But, when you look at the design, you will see the opportunity for leaking, tipping, and other minor flaws. Stainless steel design also means that you can’t fix minor issues easily. When looking at stacking stainless steel units you want something that sits flush. Even if the assembly is a bit difficult, a tight fit will fight against leaks. A unit that has gaps between pieces that fit together may also start building up mold or bacteria. Without constant cleaning, a loose-fitting unit will not last for very long. The other aspect of durability is tipping. Because stainless steel filters are usually on the countertop, you don’t want any chance of something holding gallons of water to tip over. Many people opt for built-in or faucet water filters to avoid this possibility. Ease of Installation: Yes, even water filters can be difficult to handle sometimes. But how on earth can a stainless steel water filter have difficulties? Installation is a big deal to a lot of people. Many stainless steel water filters stack together. A straightforward assembly. But, others might install into your sink, counter, or onto your existing sink faucet. How do you choose which is right for you? If you don’t feel comfortable installing hardware, stay away from sink-mounted options. You might also want to avoid faucet extensions. However, most of the counter installation or faucet extensions are simple. Detailed instructions on installation will lead you step-by-step through the process. Size: There are various “standard” sizes, but there are issues with the width and height of many stainless steel filter options. A comfortable size for many people is about 14 to 20-inches tall. This height can comfortably sit on a counter that has an overhead cupboard. At this height, you might need to slide the unit out to refill it, but it won’t be a struggle. The second issue to consider with size is your water consumption. If you are only worried about taking care of 1 person’s water needs, you’re in luck. Nearly anything will work for a single person. But, if you have a family or office of people using the same filter you need something that can handle the water use. Stainless steel has many great qualities. Most people believe that it’s visually more appealing than ceramic or plastic. But it does show fingerprints and dust buildup more easily. To solve the fingerprints and dust problem you can purchase a brushed stainless steel unit. Or, a quick wipe with a damp towel will leave the unit as clean as ever. The other advantages include reasonable temperature control and advanced cleanliness. As long as your filter doesn’t have any loose pieces that should fit together, it should stay clean. Stainless steel is known for its cleanliness. Temperature control is a bonus. You could purchase a water cooler if you’re looking for cold water. But, many basic stainless steel water filter systems keep the water well below room temperature. Finding the best stainless steel water filter of 2019 is easy. You need something durable, easy to install, and that fits your water needs. You can always choose a countertop option that you can refill as necessary or install a faucet attachment.